The convenient way to transport and store breastmilk! VIA pre-sterilized cups are ready to use straight from the pack. They can be re-used, but economical enough to discard if needed. Can be adapted to fit the Avent teats, spouts or breastpumps. Disposable Feeding should be convenient! So what is convenient about using liners that leak, are hard to measure, easy to puncture and just don't stand up to your needs? Avent gives you a convenient way to store your breastmilk with your on the go lifestyle. The first of its kind, Avent VIA integrates with the Avent feeding system giving you the same advantages of a reusable, now in a disposable! Spill proof, safe storage from a disposable! Avent VIA has a twist on lid and sturdy bas that stores easily in your refrigerator or freezer. The writable base lets you safely identify contents to personalize for baby. Right side up or upside down, you always get leak-proof storage with VIA. Empty or full, you can safely stack, pack and transport VIA which makes it perfect for vacationing or day trips. VIA bases are sterile packed and ready for use anytime. Just replace the base! The recyclable VIA base is affordable enough to throw away or can be reused several times. Save the reusable VIA adaptors and lids for use with VIA base refills. VIA bases, adaptors and lids are dishwasher, sterilizer and microwave safe. 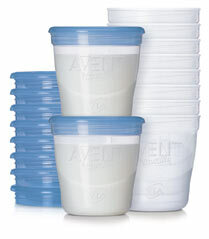 Click here to order the Avent VIA Breastmilk Storage Kit- Contains 10 VIA 6oz Bases & lids, plus 2 adaptors for use with the Avent Isis pump or Avent bottles. Bases are pre-sterilized for immediate use.